Barbados offers amazing beaches, great food, lots of shopping and plenty of culture. Despite all this, the best thing about this Caribbean island is the people. Not only are they welcoming and friendly, but everyone – from the bar staff in your hotel to the ladies and gents dressed in their Sunday best outside the local churches – has a story to tell. From the moment you step off your plane or cruise ship in Barbados, it’s easy to spend quality time with the locals. 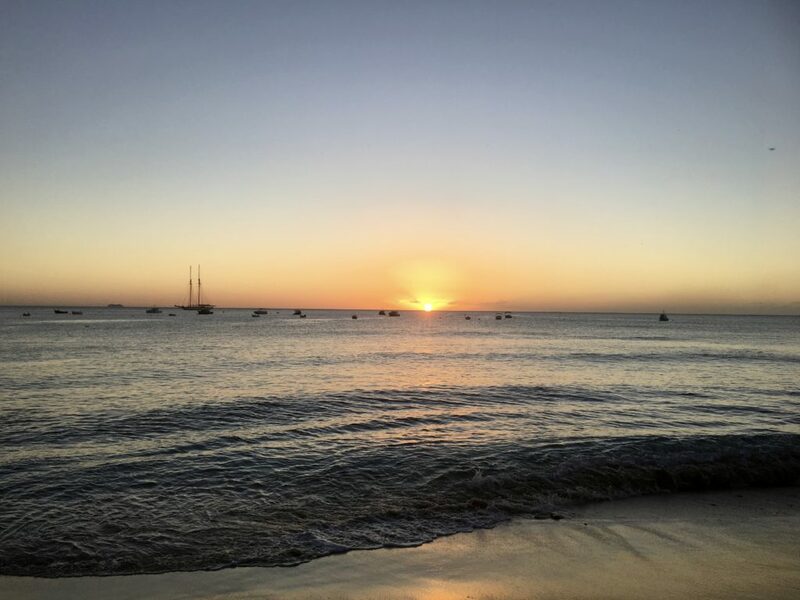 But if you want to experience authentic island life, it’s good to seeking out places where you can get to know the Barbadians – or Bajans as they’re also known – going about their everyday lives. 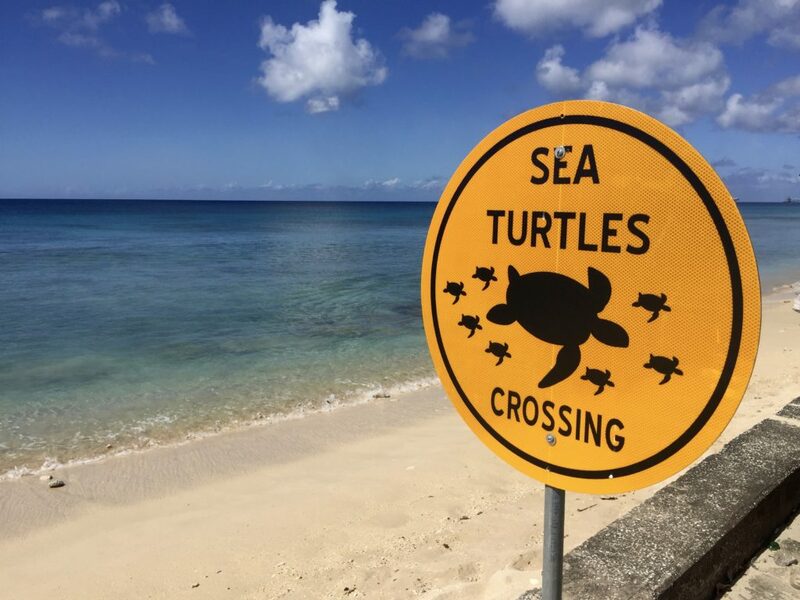 Here are five of the best ways to hang out with the locals on holiday in Barbados. Buses are cheap and plentiful in Barbados. And at just $2 Bsd ($1 USD) per bus trip, much cheaper than taxis, which can prove costly once you’re going more than a few miles. There are three types of buses in Barbados. The first is the Government-run service. These are blue with a yellow stripe. You need the correct fare on these buses as they don’t give change. There’s also two types of public transport run by privately owned operators – yellow minibuses and “Zed-R” minivans. These buses have conductors, so give change. They also accept US Dollars as well as the local currency. The Government buses follow a timetable and official routes. The yellow minibuses and Zed-Rs tend to run to a less exact timetable. But will generally follow the Government bus routes, save the odd detour. 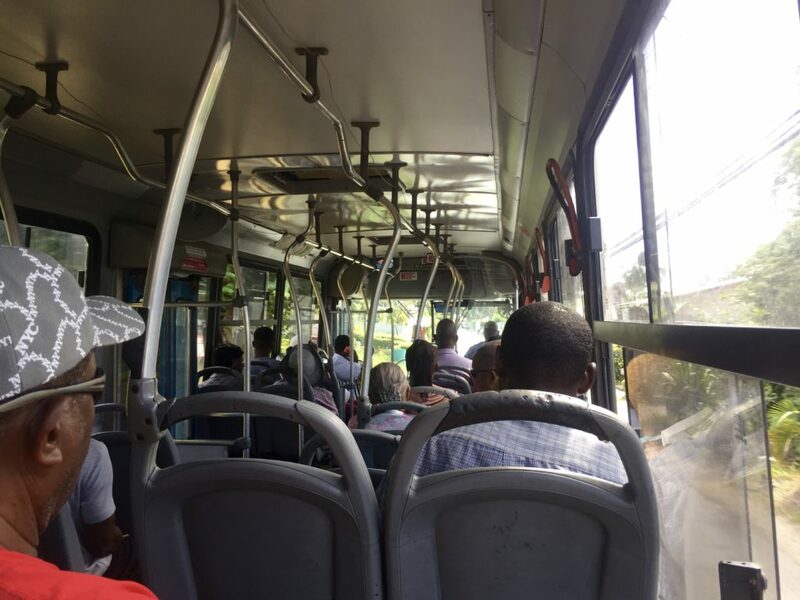 The Government buses will only pick you up from a designated bus stop (which are every few hundred yards on bus routes) or from one of the three bus terminals on the island. The minibuses and Zed-Rs will pick you up from almost anywhere on their routes as long as there’s room – listen out for their musical airhorns to let you know they’re looking for your fare. All types of buses run from around 5.30am until 12.30am in Barbados, but there fewer buses at quieter times. Even though football (the proper version – not American Football) has gotten more popular in Barbados in the last few years, cricket is still the national sport. Cricket became popular here in the late 1800s and the island – which is only slightly larger than the Isle of Wight – has produced many world-class players including Malcolm Marshall, Desmond Haynes and arguably the greatest player of all time, Sir Garfield Sobers. As you’d expect in a country so rich in cricketing talent, there are plenty of chances to go see a game. 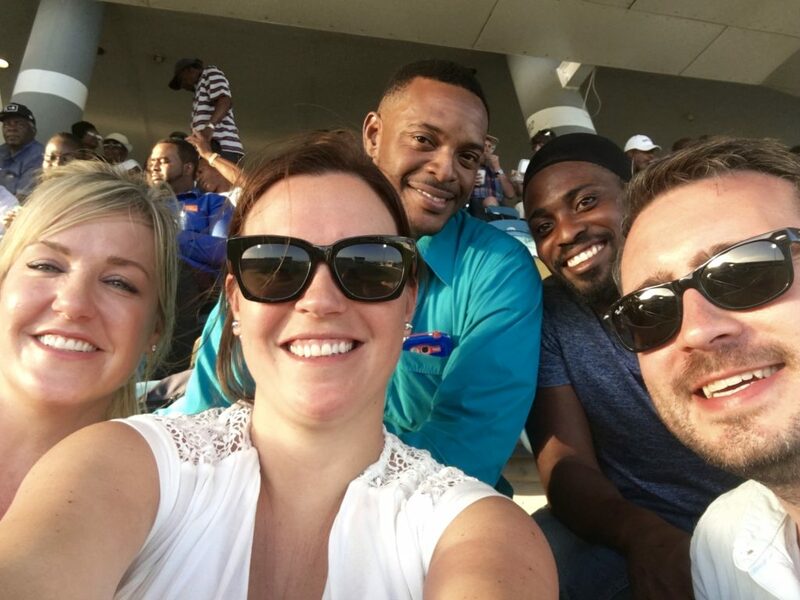 And it’s no surprise that Barbadians are passionate about their cricket, which makes it a memorable experience. There are cricket matches all over the island on the weekends throughout the year. However, if you want to see top-class action you’ll need to time your visit to coincide with the domestic cricket season (May-December) when teams from the island play each other, or regional season (January-March) when Barbados plays other countries from the West Indies in four-day and one-day games. You can also catch West Indies international matches in the spring if Barbados is chosen as a venue for a Test match, 20/20 or One-Day International. 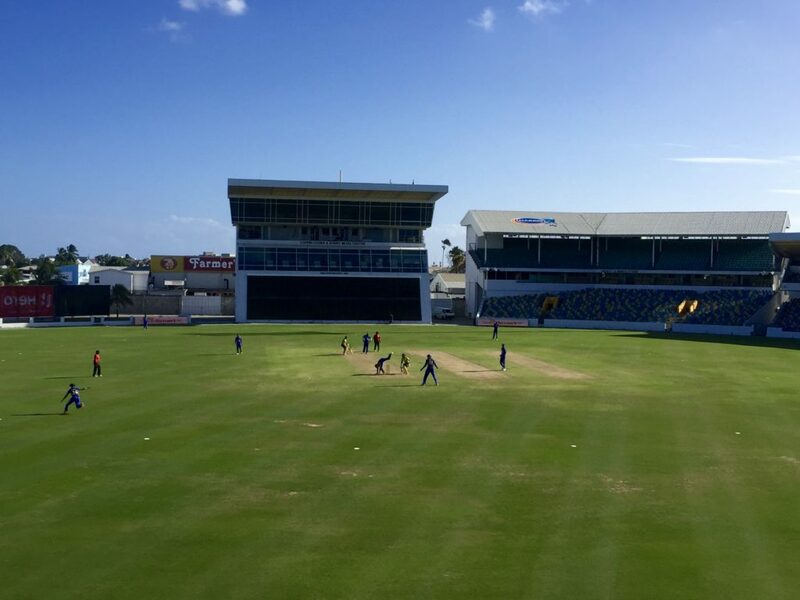 Some touring international teams will play their warm-up games against local sides in Barbados as well. There are quite a few cricket grounds that host top-class matches in Barbados. But most tourists head to the Kensington Oval in Bridgetown to see a game, which is a 15-minute walk from the Princess Alice bus terminal. The Oval is usually where the West Indies play when they’re in town. It can seat up to 28,000 people, but there’s still a great atmosphere when only one of the stands is open for a midweek game, with music, dancing and plenty of banter between the crowd and the players. Tickets for the cricket at the Kensington Oval are good value, at around $10 Bds ($5 USD) for regional matches. 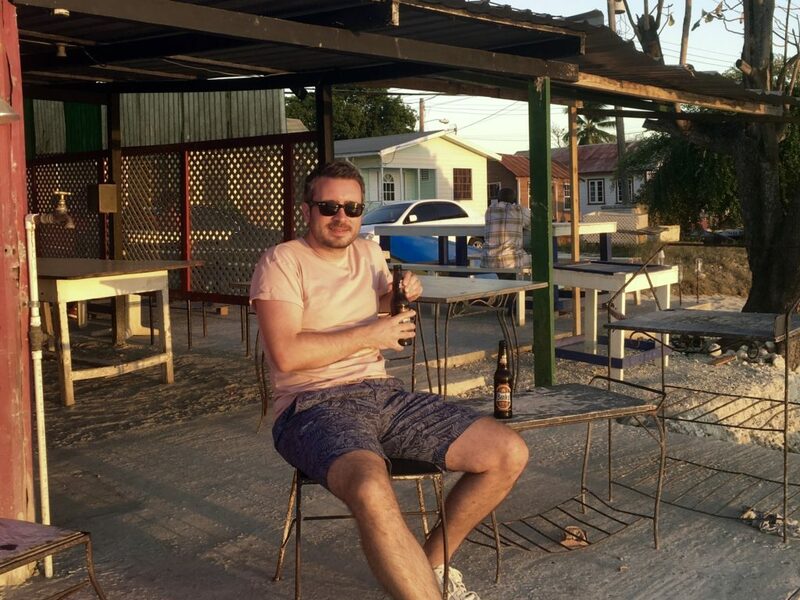 And, unlike at cricket matches in the UK, food and drink is also cheap and good quality with rum, Banks beer and food staples like fried chicken, rice and peas, macaroni pie, ribs, chips and more available. You can take in as much food and drink as you want, as long as it’s not in glass bottles. 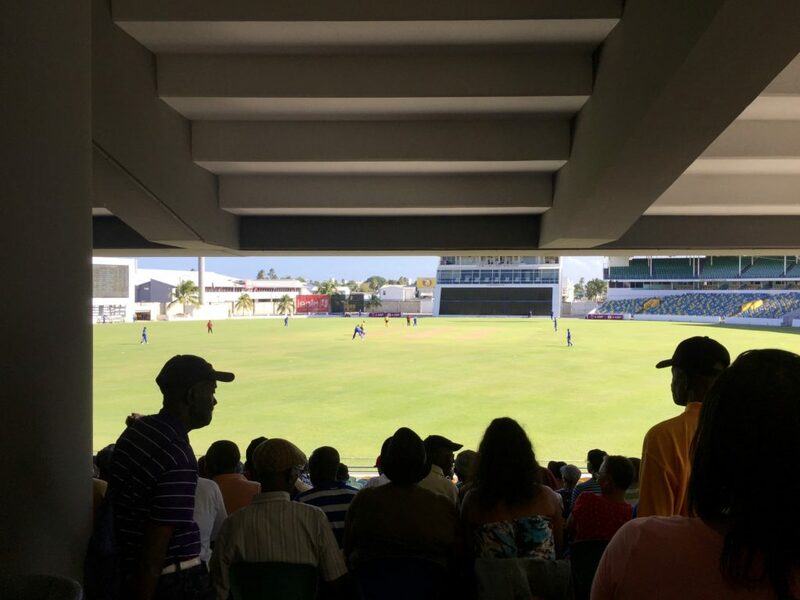 For bigger matches, the Kensington Oval has a “party stand” complete with swimming pool, manmade beach and, occasionally, unlimited food and drink. The only downside to cricket in Barbados is that it can be hard to find out upcoming fixtures. Keep and eye out on websites like ESPNcricinfo or ask around when you arrive on the island. Friday night is when many Barbadians get together to “lime” – that is to relax with friends and family in a social setting like a bar or restaurant. This often means heading to a “fish fry” where chefs cook up the day’s catch on the barbecue, often just a few yards from the sea. The most well-known fish fry on the island is at Oistins on the south coast, which has fashion and craft stalls and over 30 food outlets. It’s incredibly popular with locals and tourists. 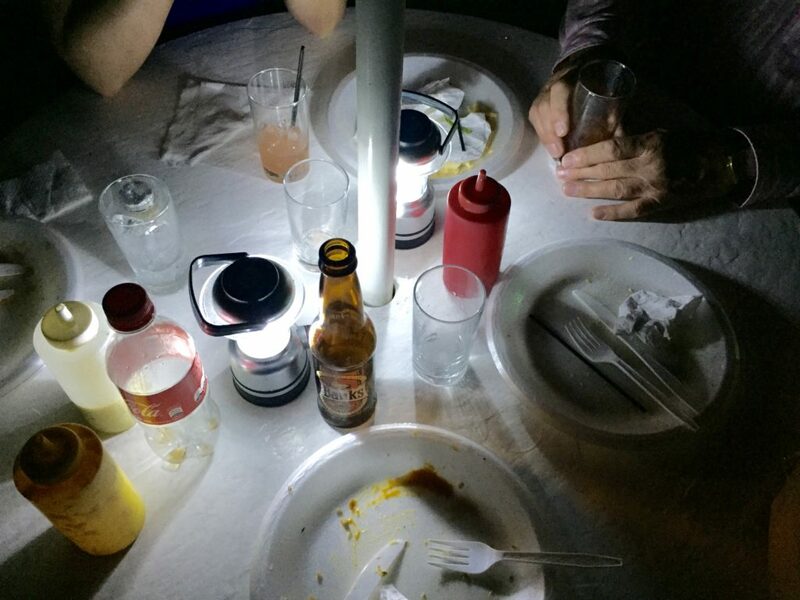 However, there are many other small fish fry events in Barbados. 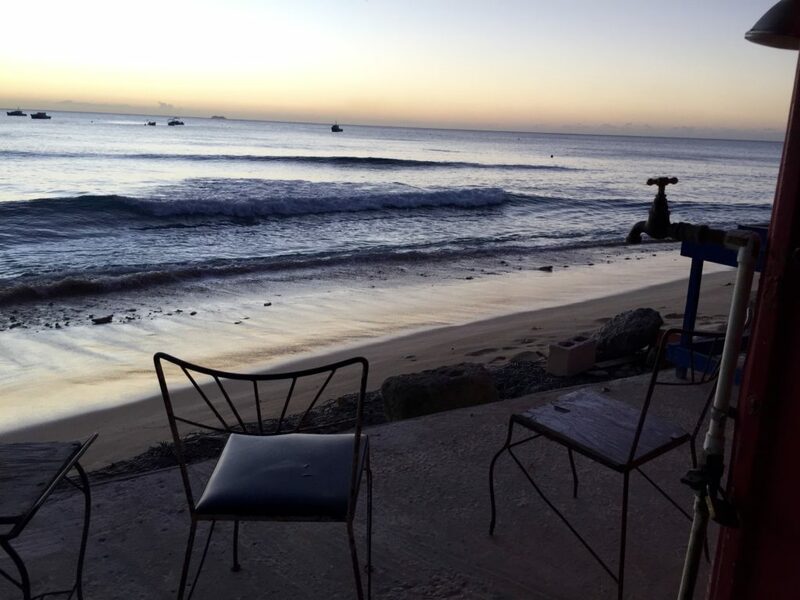 It’s often worth heading to one of these for a more authentic and chilled out experience, where you can watch the locals play dominoes and listen to the waves sloshing away at the sand as you eat. 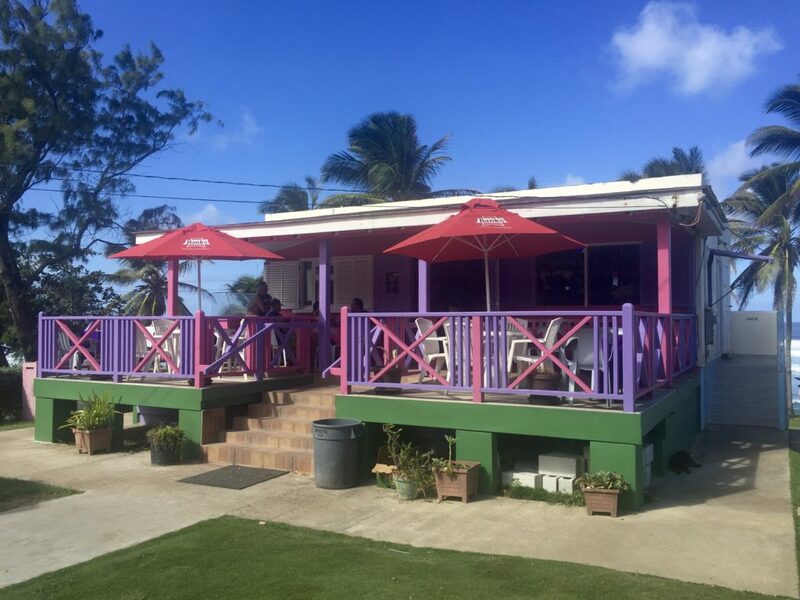 One of the best alternatives to the busy Oistins event is the Moontown Fish Fry at Merton’s Grill and St Elmo’s bar in the village of Half Moon Fort on the west coast. Here’s you’ll find an open-air restaurant perched over the beach and a karaoke bar across the road if you fancy belting out some classics after you’ve eaten. There’s also a fish fry at St Martin’s Bay on the east coast and one at Needham’s Point on the south coast. 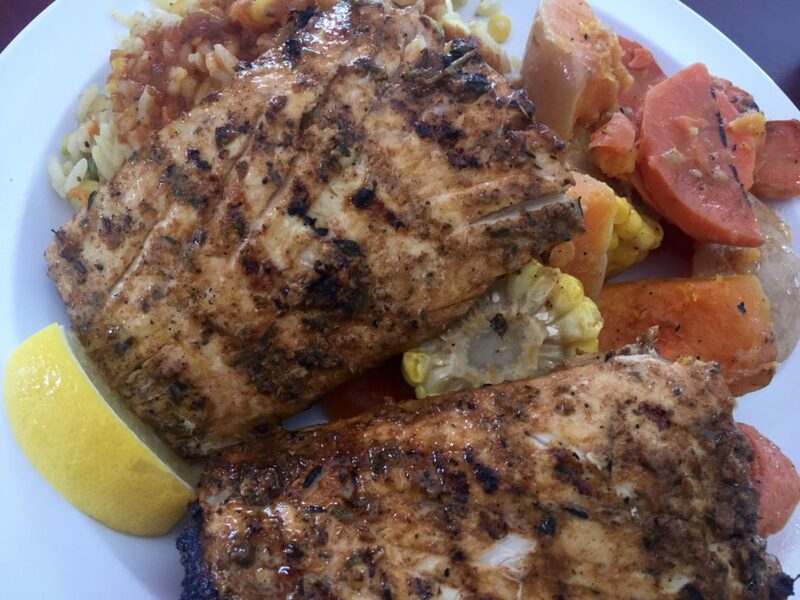 Expect to find fish such as mahi mahi (known locally as dolphin), flying fish, baracuda and tuna on the menu plus classic Bajan sides like rice and peas, macaroni pie and cou cou (a dish made with cornmeal). Because Barbados is the birthplace of rum, you’ll get fairly decent selection in your hotel bar. But no hotel can recreate the atmosphere of an authentic Bajan rum shop. Although some rum shops do sometimes sell some basic grocery items, they’re not really shops at all. They’re actually small bars that serve as the equivalent of the British village pub. Many rum shops are sponsored by a brewery, rum distillery or a mobile phone provider, so are done out in bright colours and loud logos. A few are as basic as a countertop in a shack with a few chairs scattered on the dust outside. All rum shops stock a selection of local rum (obviously), ice and mixers plus some Banks beer. A few do cutters (filled rolls) and other homecooked food. Rum shops in busier areas also sell other drinks such as cocktails and imported beer. While some rum shops will mix you a rum and coke at the counter, at many you’ll need to buy a bottle of rum and then get your ice and mixers as you need them. Bottles come in several sizes, the smallest being a “mini”, which gives you about four shots of rum. 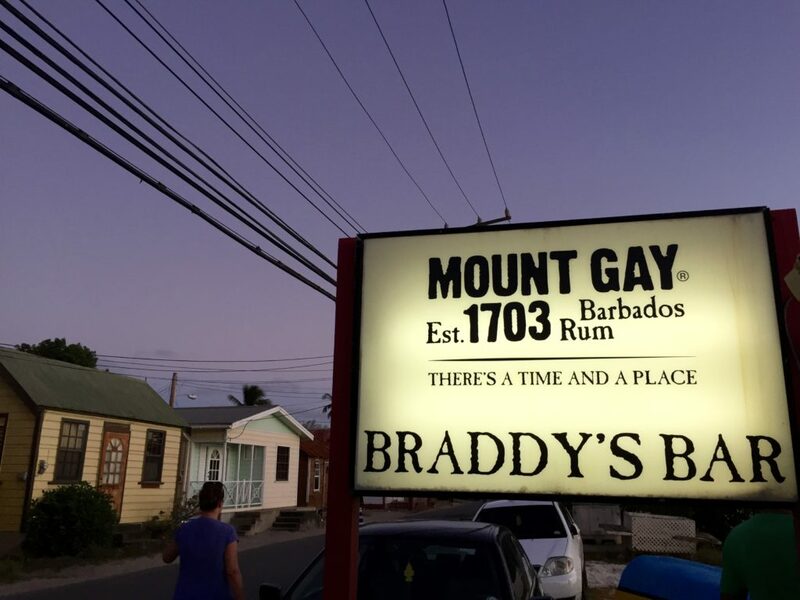 A good example of a typical Bajan rum shop is Braddy’s Bar at Six Mens Bay, a mile or so north of Speightstown and pretty easy to get to by bus. Braddy’s is both a roadside and seaside establishment, perched in a long row of small homes, fishing huts, wooden boats and palm trees. Part of it has fallen away into the sea, which adds to its charm. The back of this rum shop faces west. So it’s a magical spot to watch the sunset while the locals slide draught pieces and slam down dominoes in one of the corrugated-iron-roofed shelters that extend from the main building. OK, it’s mostly tourists at St Nicholas Abbey plantation house and gardens in St Peter. 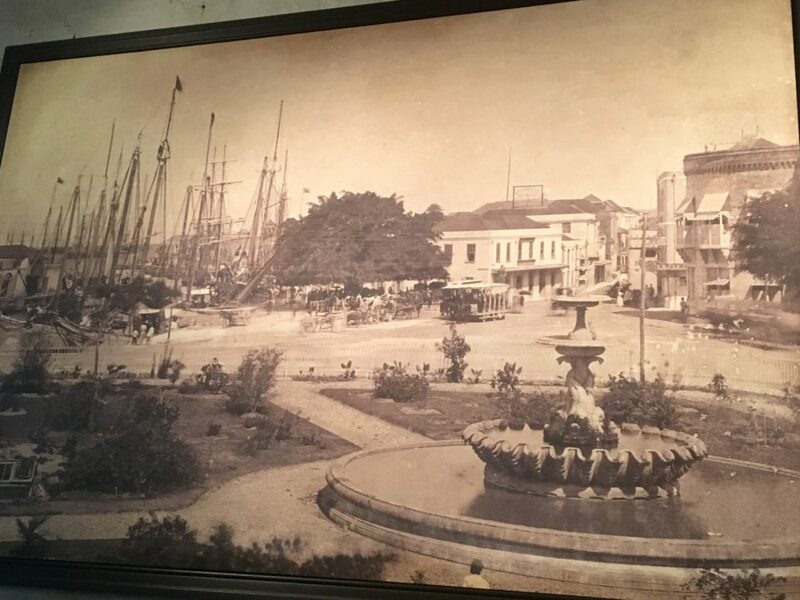 However, what you do get on a visit here is an insight into life in Barbados over the past few centuries, from the birth of the country in the 1600s through to the abolition of slavery in the 1800s and beyond. St Nicholas Abbey is also just one of a handful of commercial rum producers on the island. Its onsite steam-powered rum distillery uses non-mechanised methods of distillation, bottling and packaging. If you visit during the sugarcane harvest (January-June), you can see how the humble sugarcane was crushed into syrup in years gone by. On the tour of the house, gardens and rum distillery, you’ll also get to see a home video made by a family visitor to the plantation, Charles Cave, in 1935. 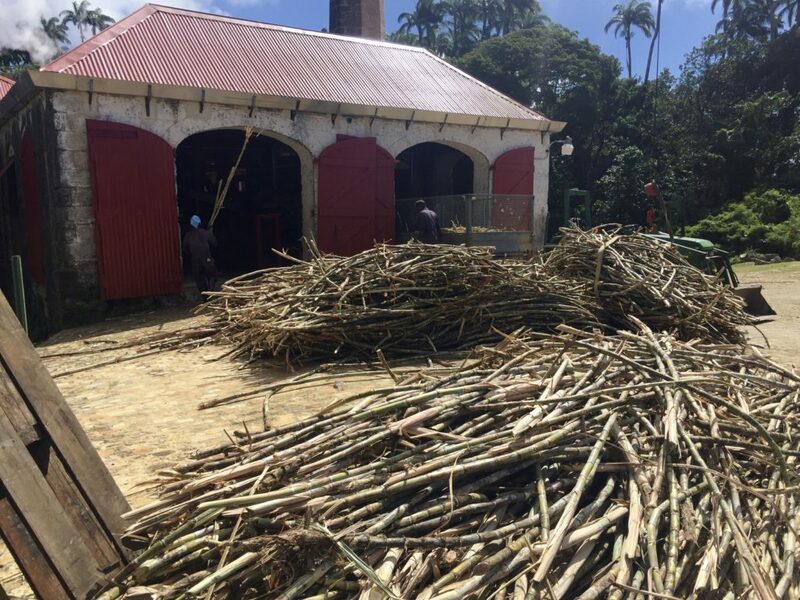 The film includes scenes from the country’s capital, Bridgetown, as well as images of life on the plantation where children as young as 10 were part of the workforce that brought in the sugarcane harvest, made rum barrels, forged wagon wheel and more. Have you been to Barbados? What are your top tips for experiencing island life and mixing with the locals? Can you take your own food on an Easyjet flight? My home away from home! For a small island there’s so much to do – Oistins is a good shout, also Harrisons Cave is a good attraction too! Would you go back? Definitely. It was my second visit after we spent our honeymoon there in 2010. We did so much more this time though! There is definitely a lot to do, regardless of what you’re into or the time of the year. You can also try some off-the beaten path places like Highland Pottery and Medford Craft centre, where you can get live demos in pottery making and mahogany crafted into objects respectively. Great suggestions Shana, I hadn’t heard of those places before. You’re welcome. I’ve written about my visit to Higland Pottery on my blog (https://roamingaviatrix.com/potters-wheel-highland-pottery/) and will do a piece on Medford Craft Centre. I like to visit and write about lesser-known places, so check back often!